The Capitani GN2 gnocchi machine produces gnocchi with fresh, cooked potatoes or with potatoes dumpling mixture. It is equipped with a device for adjusting the size and the groove of the dumpling. 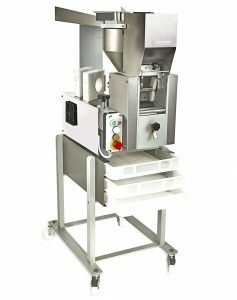 The machine is complete with automatic flour dispenser to dust dumplings and a device that allows production of both smooth and striped dumplings. The product chute allows the dough to be fed continuously by directly feeding the dough into the auger without having to stop the machine and it is possible to adjust the speed of the cutting blades to determine the length and size of the dumplings. In addition to the funnel and the auger, the forming block of the GN2 is easily removable and allows faster cleaning operations. Thanks to the rapid interchangeability of the forming block, it is possible to produce dumplings with different diameters from the classic to the small chicche and consequently to optimize and diversify the production. The parts in contact with the dough are made of food approval materials that offer a complete corrosion guarantee and are completely removable to facilitate accurate and quick cleaning. The GN2 gnocchi machine is mounted on a stand with 3 racks for standard 60cm x 40cm pasta collection trays.